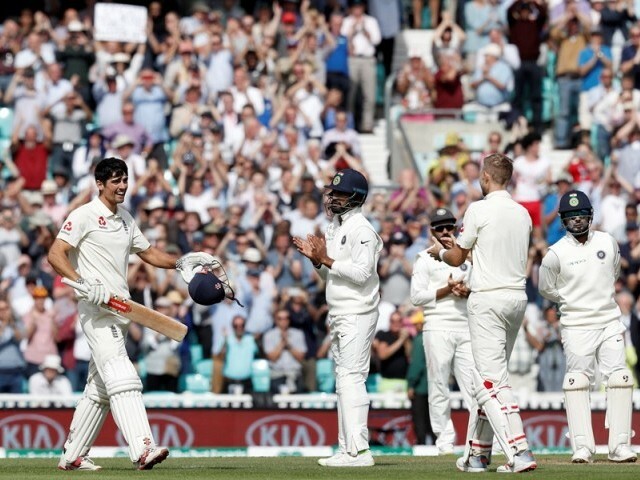 LONDON: If records were kept for standing ovations received in a match Alastair Cook would top that list too after a fairytale day at The Oval in which he engraved his 161st and last Test with a sublime innings of 147. Arriving at the crease on 46 not out to thunderous applause from a 19,000 crowd on Monday morning, England’s most-capped Test player, record run-scorer and century-maker rolled back the years. The milestones came thick and fast. Only a few balls into the day a trademark boundary off his legs took Cook to 50 — triggering the first ovation. Jonny Bairstow slogged 18 before being bowled by Mohammed Shami as England chased quick runs to top up their total before declaring and Jos Buttler fell without scoring. Ben Stokes became Jadeja’s third wicket after scoring 37 off 36 balls. A tough series appeared to have finally caught up with India as they set about trying to save the game.